In a previous contribution to SPERI Comment, I presented some of my research on the domestic ownership structure of the US federal debt. The findings showed that since the early 1980s, and especially since the onset of the global financial crisis, federal bonds have become heavily concentrated in the hands of the top one percent of US households and the largest US financial corporations. My forthcoming book Public Debt, Inequality, and Power examines the causes and the consequences of concentration in ownership of the federal debt. My efforts have been guided by the conceptual framework that Wolfgang Streeck develops in his book Buying Time: The Delayed Crisis of Democratic Capitalism. Let’s begin with the causes of increased concentration in ownership of the federal debt. In Buying Time, Streeck traces a shift in the advanced capitalist countries from a tax state to a debt state. Under the post-war tax state, gradual increases in government expenditures were matched by tax revenues, resulting in low levels of public indebtedness. With the emergence of the debt state since the 1970s onward, government expenditures continued to grow, while tax revenues stagnated, resulting in escalating levels of public indebtedness. Streeck argues that tax stagnation is the main driver of the debt state. Gradually increasing government expenditures are simply a function of capitalist development. As the commodifying logic of the market expands and deepens, the state must increase its spending on infrastructure, policing and social protection. Tax stagnation is, however, a more overtly political process, stemming from a highly organised tax revolt on the part of elites. Thus tax stagnation also implies declining tax progressivity because wealthy households and large corporations are paying less tax as a percentage of their total income. By contrast, increasing tax progressivity would see the wealthiest in society paying more tax as a percentage of their income. Due to changes in the tax system, elites have more money to invest in the growing stock of government bonds, which, thanks to their ‘risk free’ status, become particularly attractive during crises. In essence, governments come to rely on borrowing from elites instead of taxing them. And in choosing to furnish elites with ‘risk free’ assets rather than tax their incomes, the debt state reinforces existing patterns of inequality. The logical sequence of Streeck’s schema is illustrated in Figure 1. So increasing concentration in ownership of the public debt is driven primarily by changes in the tax system and the US experience corresponds remarkably well to Streeck’s schema. Since the 1970s the federal debt has been growing due to the trio of gradually increasing federal expenditures, stagnating federal tax revenues and declining federal tax progressivity. With declining tax progressivity, elites in the US are taking a greater share of national income, and investing part of that income in a growing federal debt. What about the consequences of concentration in ownership of the federal debt? Streeck claims that the debt state is harmful to democracy. Under the tax state, governments were accountable mostly to their citizenry or Staatsvolk, which demanded the rights of citizenship in exchange for loyalty. Under the debt state, however, citizens have to compete with government bondholders, or Marktvolk, which demand that the government service its debts in exchange for market confidence. To explore these claims in the US context, I conducted a simple content analysis, counting the frequency with which the terms that Streeck identifies with the interests of the Marktvolk (e.g. international, investors, interest rates, confidence) and the Staatsvolk (e.g. national, public opinion, citizens, loyalty) appear in federal government documents in three periods of time: 1957-1961, 1977-1981 and 2006-2010. The analysis does show that, as concentration in ownership of the federal debt increases, references to the interests of the Marktvolk increase relative to those of the Staatsvolk. 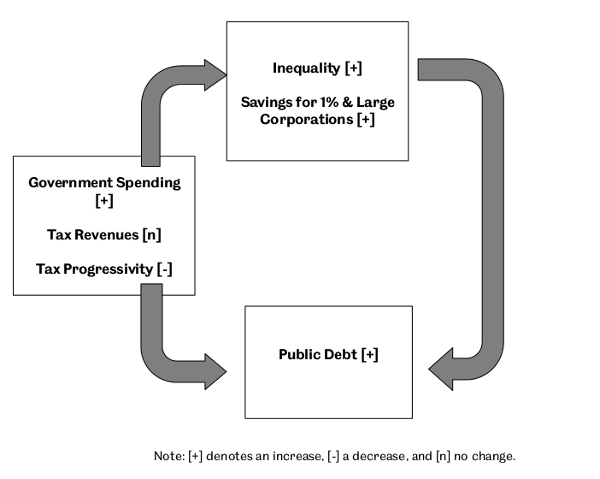 This exercise does not prove that concentration gives owners of the federal debt power over government. But what it does suggest is that inequality in ownership of the federal debt and inequality in political representation go hand in hand. My research suggests that the US debt state not only reinforces inequality, but that it also contributes to the erosion of democracy. Streeck is a comparativist. He sees the debt state as a common feature of advanced capitalism. And a cross-national analysis exploring the similarities and differences of debt states would help us to better assess the explanatory power of Streeck’s framework. Comparative research is particularly needed for the Eurozone, where a debt crisis in its periphery has brought political immediacy to the issue of public indebtedness. As a monetarily sovereign entity (i.e. one that issues debt in a currency it fully controls), the US federal government does not need to issue debt, and the fact that it kowtows to its creditors is purely ideological. Yet members of the Eurozone ceded their monetary sovereignty to the European Central Bank which means they are completely reliant on private markets to finance their deficits. The institutional set-up of the Eurozone imposes a structural constraint on governments, one that empowers owners of the public debt (Streeck’s Marktvolk). As a result, it is particularly important to uncover who the Marktvolk in the Eurozone actually are. But here’s the rub. As I point out in a new working paper, comprehensive data on ownership of the public debt outside of the US does not appear to exist. For example, in 2014 a citizen’s audit deemed 60 per cent of the French public debt ‘illegitimate’ because indebtedness was driven by tax cuts for elites and because rising interest rates had unnecessarily increased government borrowing costs to the benefit of wealthy bondholders. In the end, however, the audit was forced to admit that its findings were largely speculative because reliable records on ownership of the public debt were unavailable. Reflecting on the audit, one commentator went so far as to declare the ‘legally organised ignorance’ of the identity of owners of the public debt stands as ‘one of the world’s best kept secrets’. To bring about progressive change, we need accurate data on the winners and losers of contemporary capitalism. Unfortunately, a lack of transparency in our data only serves to conceal, and therefore reinforce, the power of those that have gained the most from the debt state.